Proper storage for museum collections should provide easy access to the collections while protecting the art objects in a safe and secure manner. Important concerns for safe storage are: adequate security, proper environmental conditions, selection of appropriate storage fixtures, and proper packing and support of artifacts in storage. Storage areas should be clean, well ventilated and properly illuminated. Temperature and humidity levels and air quality must be monitored regularly. Appropriate fire protection should be installed. Illumination should allow staff access to the collection without causing damage to the collection. While stored, items should be in the dark at all times. 1. Small objects are best stored on shelves or in drawers. Steel shelving or drawers with a fused powder coating are good choices. Anodized aluminum is also good. Wood and wood products are generally not recommended because of the off-gassing of volatile components, primarily acids from wood and formaldehyde from adhesives. 2. All shelving should be padded to cushion the objects and reduce the risk of abrasion. Polyethylene Microfoam is the best padding material. Dust and light covers should cover open shelving units. Muslin lined with black polyester fabric makes an ideal dust and light cover. 3. Exhibition furniture, office records, publications and other non-collection material should be kept in a separate storage area for both safety and convenience. 4. Maps, documents and small objects are best kept in flat files in shallow drawers. Acid-free paper and glassine should be utilized as interleaving for paper documents. Glassine should be changed periodically as it turns yellow (it is not stable over the long term). Glassine is most commonly used to interleave chalk and pastel drawings. 5. Photographs and documents that are the same size or smaller than file cabinet drawers, may be stored in Mylar (a polyester) sleeves within acid free folders or envelopes. Care should be taken not to place too many pieces within a folder, causing them to be crushed against each other. 6. Clothing in sound condition is best stored on padded hangers in wardrobes, or if fragile, individually in shallow, acid-free boxes. This method will provide easy access and labeling, as well as minimize crushing and overcrowding. 7. Lift boxes, artifacts, equipment and furniture off the floor. All collections items should be at least six inches above the storage floor. This protects them from insects, moisture and cleaning equipment. CCI Notes is the most important collection care publication a museum can acquire. A collection of over 90 technical leaflets written for a broad audience, topics in this continually expanding series range from "Removing Mould from Leather" to "Storage for Costume Accessories" and "Indoor Display of Industrial Collections." 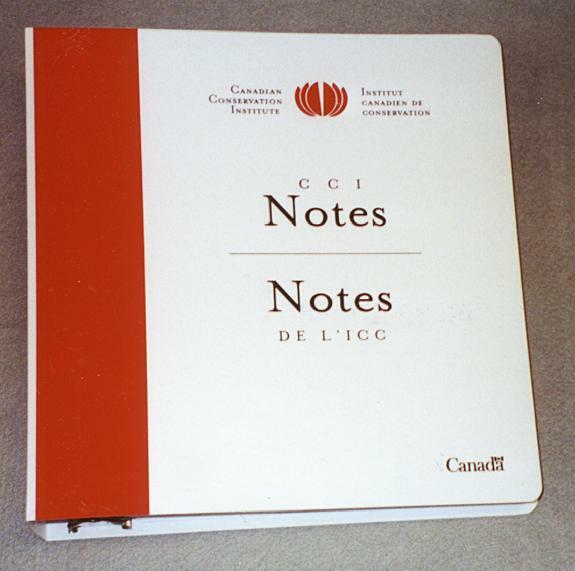 CCI Notes are illustrated, include supplier lists and a thorough bibliography. CCI Notes is available online at the CCI website. Note: this publication is not a compilation of the CCI technical bulletins. Cold Storage Facilities in the U.S.
Why are so Many Artifacts in Storage?